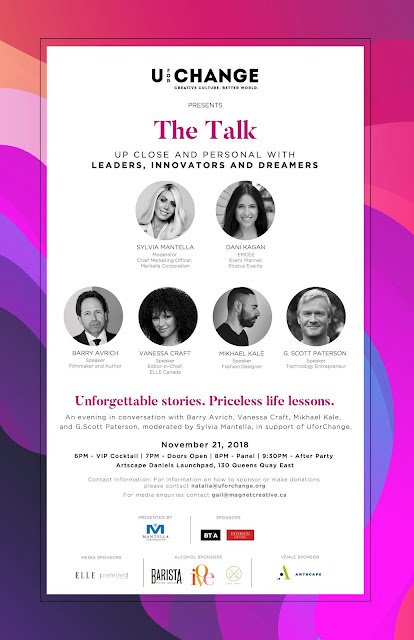 Toronto, ON – On Wednesday, November 21, 2018, five of the country’s most brilliant and innovative minds will come together in support of one of Canada’s most creative charities UforChange with “The Talk” – a live panel discussion with producer/director and advertising executive Barry Avrich, ELLE Canada Editor-in-Chief Vanessa Craft, fashion designer Mikhael Kale, and technology entrepreneur G. Scott Paterson; moderated by philanthropist and Mantella Corporation’s Chief Marketing Officer Sylvia Mantella and emceed by Dani Kagan of Stratus Events. His Worship, John Tory, Mayor of Toronto is scheduled to provide remarks shortly preceding the panel discussion. Notable guests expected to be in attendance include Anna Hopkins (Shadowhunters, Bad Blood), Natasha Negovanlis (Carmilla), actor Michael Seater, Brittany Raymond (The Next Step), Evan Biddell (Project Runway All Stars), Joan Kelley Walker, Ann Kaplan, Grego Minot, television host and author Andrea Bain, Alexis Honce (The Marilyn Denis Show), Susan Langdon (Toronto Fashion Incubator), fashion designer David Dixon, fashion stylist George Antonopoulos, Barb Atkin, television and radio personality Glen Baxter, fashion journalist Derick Chetty, fashion designer Christopher Paunil, Jordan McKay of HENDRIXROE, and more. Proceeds from ticket sales and donations will help fuel the next generation of young creatives at the Regent Park-based youth arts charitable organization by allowing youth to obtain an arts education during the next program cycle. Those unable to be present for the event can purchase tickets to sponsor an UforChange youth to attend on their behalf. As Toronto is becoming a city filled with opportunity as well as facing the challenge of rising living and education costs, and unfortunately gun violence, UforChange wants to ensure all youth have the opportunity to explore the arts in a safe and positive space for all genders, backgrounds, and races to be included. UforChange provides young people, ages 16 to 29, from all over the Greater Toronto Area, with a combination of creative, practical, and soft skills that will help them develop their careers in a safe, supportive, and collaborative environment. They achieve this through their Core Arts program, offered to over 30 young people every year, along with a series of industry partnerships that lead to workshops and mentorships, which empowers another 350 youth every year. Since 2009, UforChange has served over 2,450 youth from all over the Greater Toronto Area, over 600 youth have graduated from their Core Arts Program from which 323 joined post-secondary education, 555 were offered paid employment opportunities, and 665 volunteer opportunities. UforChange provides young people, ages 16 to 29, from all over the Greater Toronto Area, with creative and practical skills in a supportive and collaborative environment to help them thrive as entrepreneurs and professionals. The eight-month program is taught by industry professionals who provide the youth with opportunities to apply their skills in theoretical and practical scenarios. 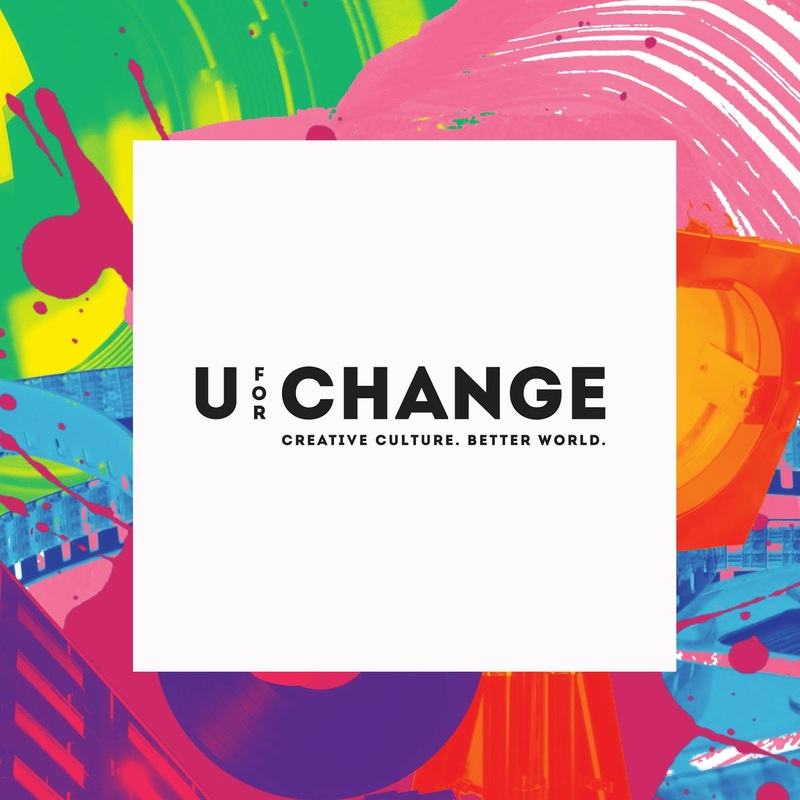 Operating out of its Regent Park studio, UforChange has served over 2,450 youth with over 612 program graduates, 323 enrolling in post-secondary education, and over 1,220 youth finding opportunities to volunteer and work in the arts. UforChange began in the heart of St. James Town, a Toronto neighbourhood thriving with young people from around the world. The founders identified a void in the area; the community was lacking an arts organization in the diverse neighbourhood. From there, UforChange was created offering young people the opportunity to pursue their creative passions with a spectrum of arts programs from DJ to fashion to film. Initially serving young people of St. James Town, UforChange has grown to serve Regent Park and the Greater Toronto Area. Their mission is to mentor young people in the pursuit of their artistic and aspirational passions in an inclusive community. The Core Arts program includes 8-month courses in Fashion Design, Photography, and DJ Arts that teach youth the fundamentals of each subject and also provides them with opportunities such as post-secondary education support, non-traditional educational programs, access to paid and unpaid industry opportunities, and more. Beyond their Core Arts program, one of their biggest initiatives is Workshops in the 6ix, which provides youth unable to commit to the 8-month program with short-term, high-impact forums in a variety of arts-related topics. Despite the economic challenges the charity faced over the past year, they were able to not only continue offering these services but also responded to the needs of youth and launched innovative programs to address these. In the fall of 2017, they offered a series of workshops focused on personal and professional development, which prepared 72 young people for the rising freelance economy. Additionally, they launched a 3-month program for female-identifying individuals in Graphic Design and Web Development that will serve 30 participants by March 2019. By offering these services they over-delivered their target and served 467 young people during the 2017-2018 term alone. For more information, visit uforchange.org. Sylvia Mantella is a Canadian philanthropist, conservationist and the Chief Marketing Officer of Mantella Corporation. She currently sits on and advises a total of 11 boards and committees in the philanthropic arena. Sylvia has devoted the last decade to the protection and preservation of exotic wildlife through the Sanctuary founded by herself and her husband. Sylvia recognizes how critical it is to support the Canadian fashion industry and is dedicated to the ongoing support of Canadian fashion designers. Paired with her inherent nature to give back to the community, makes Sylvia an exceptional role model. Through attentive, strategic and very selective branding decisions Sylvia has been an integral asset to the growth of Mantella Corporation. Mantella Corporation is one of the largest privately held family-owned real estate and land development companies in Canada. They have distinguished themselves as market leaders who maintain an entrepreneurial culture without compromising their social responsibility. Sylvia and the Mantella Corporation are honoured to support U for Change and continue to be strong supporters of the Canadian fashion industry. Barry Avrich is a Canadian director, producer, author, and advertising executive. In a career spanning 30 years, Avrich has made over 45 notable films and was also responsible for creating The Daniels Hollywood Theatre, the world's first movie theatre inside a children's hospital. His critically acclaimed documentaries include Show Stopper: The Theatrical Life of Garth Drabinsky, The Last Mogul: The Life and Times of Lew Wasserman and An Unlikely Obsession: Churchill and the Jews. Avrich also produced the winning film adaptation of the Stratford Festival's The Tempest with Oscar-winning Christopher Plummer. This year Barry released 2 new films; The Reckoning: Hollywood’s Worst Kept Secret, and Prosecuting Evil and is in post-production on Radical Obsession. Last year, Barry released the critically acclaimed film Blurred Lines: Inside The Art World on Netflix. An award-winning journalist and novelist, Vanessa holds the distinction of becoming the first black Editor-in-Chief of any ELLE magazine around the world. Since her appointment in 2016, the magazine has broadcast a live editorial meeting from Facebook headquarters (the first of its kind in North America), launched a national writing competition to increase the diversity of voices in the magazine and expanded the range of cover stars to include more women of colour, including Canadian model Winnie Harlow, South Asian superstar Priyanka Chopra and actress Tracee Ellis Ross. As a jet-setting authority on fashion and beauty and a fixture at international runway shows, Vanessa has interviewed some of the biggest names in fashion and celebrity circles, including Marc Jacobs, Christian Louboutin, Victoria Beckham, Gigi Hadid, Alicia Keys, Christopher Bailey, Nicolas Ghesquière, Gwyneth Paltrow, Keira Knightley and Michael Kors . She also stars as the resident judge on television show, Stitched on Slice Network. Vanessa was born and raised in Toronto, Canada and got her professional start in London, England, as an intern at the Sunday Times Style. Her work history is non-traditional, ranging from fashion, lifestyle and sports journalism to the music industry and includes stints working at the BBC, Channel 4 television, The Sunday Times UK, and as the founder and editorial director of the award-winning website Kickette, a sports gossip site for women. Kale is known for his conceptual approach to fashion design with attention to detail, craftsmanship, and tailoring. A student of London’s Central Saint Martins, whose illustrious alumni includes Stella McCartney and the late Alexander McQueen. Mikhael’s creative approach began in Milan with esteemed labels such as Antonio Marras and BALLY, later leading to a design position with exte under the tutelage of Sergio Ciucci and Alessandro De Benedetti. Since launching his eponymous label in 2007 Mikhael Kale has been featured in international publications such as WWD, New York Times Style magazine, Dazed & Confused, Vogue; as well as worked with international style setters such as Beyoncé, Gigi Hadid and Bella Hadid. Most recently, CAFA awarded Mikhael Kale with Womenswear Designer Of The Year. G. Scott Paterson is a technology entrepreneur focused on fintech and media. He has been recognized for decades as one of Canada’s leaders in technology and media finance. He serves as a Director of Santa Monica-based Lions Gate Entertainment (NYSE:LGF) and Chair of the Company’s Audit & Risk Committee. Mr. Paterson was the second investor in Lionsgate when the company was founded in 1997 and is the only person remaining from the company’s inception. Mr. Paterson serves as Executive Chairman of Toronto-based FutureVault Inc which he co-founded in 2014 and as Chairman of Los Angeles-based QYOU Media ‎Inc. (T¬XSV:QYOU), which he co-founded in 2014. QYOU Media is a global leader in the curation, licensing and packaging of short-form video for distribution through cable, satellite, and networks globally. Mr. Paterson is also the Lead Director of Toronto and Los Angeles-based Giftagram, a rapidly growing e-commerce mobile gifting app. Mr. Paterson has also served as Chairman of the Canadian Venture Stock Exchange, Vice Chairman of the Toronto Stock Exchange, a Governor of the Investment Dealers Association, a Director of the Canadian Investor Protection Fund, and a Director of the Canadian Securities Institute. Mr. Paterson was instrumental in orchestrating the subsequent take-over of the CDNX by the TSX in 2001. Mr. Paterson has established bursaries at Western University and in 2000 donated $1 million to establish the G. Scott Paterson Wing at the Schulich Medical School. Mr. Paterson has seven children and he and his wife Sarah enjoy water and snow skiing, playing squash and time in cottage country.